New Horned Dinosaurs from Utah Provide Evidence for Intracontinental Dinosaur Endemism. 2010. S. Sampson, et al. PLoS One 5(9): e12292. Two remarkable new species of horned dinosaurs have been found in Grand Staircase-Escalante National Monument, southern Utah. The giant plant-eaters were inhabitants of the "lost continent" of Laramidia, formed when a shallow sea flooded the central region of North America, isolating the eastern and western portions of the continent for millions of years during the Late Cretaceous Period. 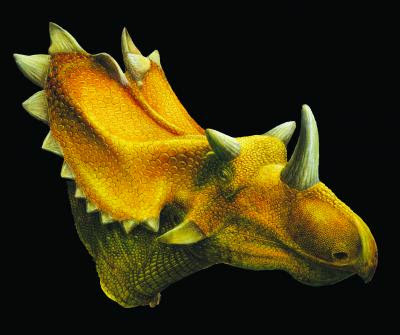 Kosmoceratops richardsoni (KOZ-mo-SARA-tops RICH-ard-SON-i); the first part of the name refers to kosmos, Latin for "ornate," and ceratops, meaning "horned face." The latter part of the name honors Scott Richardson, the volunteer who discovered two skulls of this animal. Kosmoceratops has sideways oriented eye horns, although much longer and more pointed than in Utahceratops. In all, Kosmoceratops possesses a total of 15 horns—one over the nose, one atop each eye, one at the tip of each cheek bone, and ten across the rear margin of the bony frill—making it the most ornate-headed dinosaur known. The bigger of the two new dinosaurs, with a skull 2.3 m long, is Utahceratops gettyi (U-tah-SARA-tops get-EE-i). 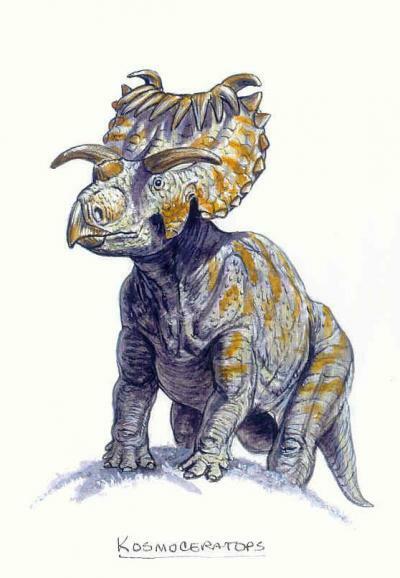 The first part of the name combines the state of origin with ceratops, Greek for "horned face." The second part of the name honors Mike Getty, paleontology collections manager at the Utah Museum of Natural History and the discoverer of this animal. 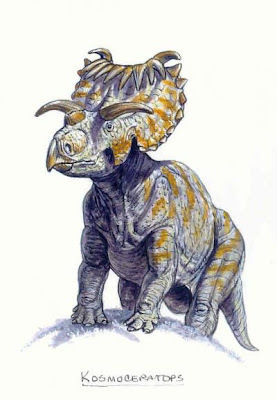 In addition to a large horn over the nose, Utahceratops has short and blunt eye horns that project strongly to the side rather than upward, much more like the horns of modern bison than those of Triceratops or other ceratopsians. More info & pictures here. Nice work by everyone on this paper! Congrats to my old pal & Palaeo Extraordinairie, Mike Getty, who deserves to have a whole clade of dinosaurs named after him!